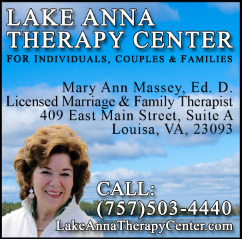 St. Jude parishioner, Mary Ann Massey Ptasznik, is a licensed Marriage and Family Therapist in Louisa. We support her on this site because she is Catholic, a seasoned practitioner of 36 years, and she is local. Dr. Massey works with individuals and couples on a wide range of issues: anxiety, depression, addictions recovery, marriage enrichment, divorce, life and work transitions, and other areas of importance. She also works with adults and their aging family members on communication and relationship issues that emerge when aging limitations mandate change. one for counseling activity(including fees) and the other about aging family issues. We invite you to check her out to see if her skills and experience might be helpful to your needs.